"See how the fields are ripe for harvesting." IN OUR increasingly urban context, where food comes from the supermarkets and the countryside is a place we visit for a refreshing walk, harvest has lost some of its significance to many of us, yet it is a time of theological importance to Christianity. In the world, it is a culmination of the new life celebrated in spring; in the church, of the new life celebrated in the Cross and Resurrection. It is a time of celebration of the gathering in of the produce, physical and spiritual, which we have nurtured over the past year. Although harvest may be more difficult to tie into an urban context, for those who started new jobs or school years, this time is one for building on the life experiences that have brought us to where we are. This summer I was ordained deacon, an initial summation of five years of exploration and formation. Having had a relatively gentle settling time, October now heralds the beginning of a reaping of what was sown in that time of training. When the harvest is gathered in, it is the end of the job of sowing and growing, but the beginning of the job of turning that harvested produce into something useable. Wheat is turned into bread, grapes become wine; likewise, my theological training needs to become an ingredient of something greater. This is therefore an exciting time for me, though also a daunting one. 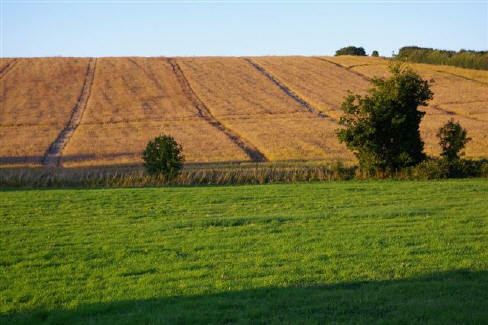 Similarly, this is a time of harvest for the parishes of the North Cheltenham Team. Over the last two years, people have negotiated and nurtured the proposed Team through various levels of consultation and decision-making locally, in the diocese, and finally at the Church Commissioners in London. Clergy and laity from all the churches have met and consulted and prayed, and the result is: we have a Team. But the Team is not an end in itself: we have to do something with it. It has also not been a cost-free exercise: despite all that we gain from each other, we have also lost one of our churches. Cheltenham St Peter will close this month, following a service to give thanks for the role that church has played in the local community. There has been cost in bringing this crop to harvest, and we now have the responsibility of ensuring that what we gather in is put to good use to make something new that exceeds the sum of its parts. This is not a task for clergy alone: the church subsists in us all working together to further the kingdom of God, and so if we want to flourish as parishes we now have to recognise that our distinctive parish churches are a part of the wider Team, which is itself a part of the wider Church of England, which is a part of the Anglican Communion, which is a part of the great Church Invisible, the Church Catholic, under the head of our great high priest, Jesus Christ Our Lord. The 2009 Passion Play launch meeting is on Wednesday 22nd October at 8pm at St Nicolas’ Church, Swindon Lane, when we shall read through the script, distribute the rehearsal schedule and start the process of casting. If you are interested in taking part in any way do come along to this meeting. Anybody and everybody is invited. ON 1ST SEPTEMBER the new North Cheltenham Team Ministry came into legal existence. This means that the parishes of Prestbury and All Saints’ are now members of a Team Ministry which joins them with the new parish of Swindon Village and Cheltenham St Peter and the parish of Elmstone Hardwicke with Uckington. The staffing of this new Team looks, on paper, to be quite generous. Fr Michael is now Team Rector and Fr Daniel is now officially a Team Vicar. Fr Stephen Eldridge, formerly priest-in-charge of St Peter’s, Cheltenham, is now also a Team Vicar in the new Team Ministry. Our other licensed clergy include Fr Paul and Fr David Eady, both Associate Priests on a House for Duty basis and Fr Peter and Fr Mike French, both priests in the Team on a non-stipendiary basis. We currently have our two curates, Fr David and Fr Andrew and also Andy Macauly who is our licensed Youth Minister. We also have the benefit of the ministry of four Readers: Linda Biggs, Neil and Sarah Jones and Ralph Griffin. Quite a lot of staff representing a wide breadth of experience and gifts! The next challenge is to make the best use of all these people! The intention is to reach a point where all of the main Sunday congregations in each church in the Team will have the continuity of being led by one person – their ‘own’ priest or minister – whom they will see regularly. Fr Daniel will be the principal minister for the Celebrate! and 11 o’clock congregations at St Mary’s. Fr Stephen will take this role at 10.30am at All Saints’. Fr David Eady will continue in this role at St Lawrence’s Swindon Village and St Mary Magdalene Elmstone Hardwicke, where he is assisted by Neil and Sarah Jones and Ralph Griffin as Readers. Fr Michael will be the principal priest at 9.30am at St Nicolas’, which will also allow him time on a Sunday to go on to join one of the other congregations in the Team. Our assistant clergy, curates and Readers will support this pattern on a Sunday, moving between congregations to preside when appropriate and to preach. Although on some Sundays a ‘different face’ will appear, the aim is to establish a more settled pattern of ministry. The other Sunday services and weekday Eucharists will continue to be taken on a rota basis. Obviously we will keep the working of the new Team under constant review and would welcome any comments or observations you might wish to make. As you will be aware, St Peter’s church is due to close. From 6th October it will officially be ‘redundant’: closed for public worship. The exciting proposals for the building are that it will be transferred to ‘The Rock’, a newly established trust which will use it as a venue for a wide variety of youth ministry. There will be a closing service, conducted by the Bishop of Gloucester, to give thanks for the Christian witness of the community at St Peter’s throughout its life as a parish church. This will be on Sunday 5th October at 6.30pm. As an expression of our concern and support for the current congregation at St Peter’s there will not be any services in St Mary’s or All Saints’ on that evening. It is very much hoped that as many people as possible will attend the closing service. Please make it a priority. The first time I met Bob was twelve years ago when I came to Prestbury to be interviewed. Gill and I were scheduled to have lunch with Bob and Barbara and so had our first experience of their hospitality and generosity. Needless to say, we over-ran our allotted time with them! At that time Bob was churchwarden of Prestbury, a position he held for forty-six years. He first served under Canon Norman Kent, who noticed that when Bob and Barbara first attended St Mary’s Bob did not receive communion. Canon Kent arranged for Bob to be confirmed and then very quickly after that he invited Bob to become Churchwarden. We celebrated those forty-six years of devoted service in June 2002 when Bob decided it really was time for him to retire! I know how much Bob’s wise counsel and loyal support have been valued by those clergy he has worked with over the years, and also I know how practical his contribution has often been. We have many physical things to remind us of Bob: the wooden ciborium which contains the reserved sacrament, the staff for the processional cross in St Mary’s, the staves for the Wardens at St Nicolas’, and I and a number of others have a wooden cross and candle holders which we take with us when we take communion to the sick and housebound. All made by Bob. 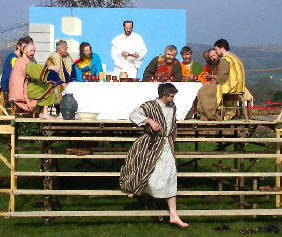 We have recently begun preparations for the 2009 Prestbury Passion Play. Bob has been heavily involved in all of the Passion Plays since Fr Ian Hazlewood was inspired to produce the first one. Bob has taken a key role in production but has also taken acting parts – perhaps most memorably as the Roman centurion in his impressive costume! He was very committed to ensuring that we would produce the play again and the last time I was with him was at a planning meeting: Bob there with his notebook, keen to get on! Bob’s Christian faith was firm and sure. For his funeral he had chosen an extract from Pilgrim’s Progress which seemed to speak of the certainty of Bob’s faith, his belief that at the end of his earthly journey he would finally be face to face with his Lord and Saviour. And Bob truly lived out his faith; he was a tremendous example to us all of someone whose faith underpinned the whole of his life. 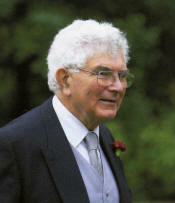 And so Bob’s Christian service was not restricted to his church but extended out into the community through his work as a GP, in his work with young people through scouting, our local church schools and also through many other things, such as the work of the Prestbury United Charities, of which Bob was chairman. In the Funeral Mass, which was attended by over 400 people, the fullness of Bob’s life was reflected and celebrated. We thanked God for Bob’s unique life, we thanked Him for all that we have shared with Bob, for all the ways in which Bob has touched our lives, and we commended him into God’s love and care, praying that he may now share in that great banquet in heaven which is his very well deserved reward. 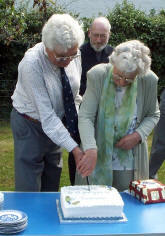 Bob and Barbara cut the cake at Bob’s Retirement Party as churchwarden in June 2002. In the background is Fr Ian Hazlewood. My first experience of Bob Lyle was the day I moved in. There I was with a group of friends when we were suddenly interrupted by a loud buzz. Finding noone at the front door it took us several moments to realise that there was a buzzer at the back and there was a kindly, slightly confused-looking old man with a shock of white hair, a ruddy face and a shy smile, who promptly informed me that he had a key for the house but thought it best to ring! Within weeks I’d learned that Bob always came to the back door – the only caller ever to do so – and over the past months it has always been to give me things I need: vegetables that are still growing in the garden, an extension lead for my hedge-trimmer (complete with goggles and gloves), a bird box I still haven’t put up (complete with instructions on how to build another one), even a Cornish pasty picked up on holiday. From the very beginning Bob and Barbara made it clear that I was welcome any time, embodying perfectly what it means to be a neighbour to others, and I soon found that they were helpful and reliable. I was even able on one occasion to leave Bob in my front room drinking tea with a gentleman of the road while I rushed off to a PCC meeting! For all those who have encountered this gentle and untiring man, whether they have known him for many years or only a few months, he leaves a legacy that is more precious than gold: a footprint of Christ that will remain for a very long time to come. Thank you for the wonderful sense of fellowship I felt at Bob’s uplifting service with so many of you. Its strong message of resurrection left me strangely calm and peaceful. Now the tasks ahead are being eased by so many family and friends giving their support. I am most profoundly grateful to you for the many kind messages of sympathy and warm tributes to my dear Bob. The task of replying to them all personally is so daunting that I trust you will not take amiss this printed token of my personal gratitude and that of my family. SATURDAY 13th September dawned bright and fair for my cycle ride. All Saints’ was first, and I called before it was open, so I left a ‘witness’ note. At St Luke’s a CODS member was setting something up and signed my list. A short pedal to Emmanuel and Ss Philip and James, then up the A46 to St Christopher’s, Warden Hill. Back on the A46 for two miles to St Paul’s, Shurdington, where a co-MU member welcomed me, then off to Holy Trinity, Badgeworth, a lovely quiet church, where drinks had been left for thirsty travellers. In Churchdown I called at the Chapel Hay Methodist church, then St Andrew’s, one of the two parish churches, with its adjoining hall and well-used parish centre. A downhill run through Pirton Lane led me towards Longlevens, where I used the cycle track, coming to Holy Trinity, Victorian built, celebrating its centenary next year. Moving towards Gloucester I called at St Catharine’s at Wotton where I couldn’t resist the coffee, a lovely welcome! Next was St Mark’s, Kingsholm, via Denmark Road, and then I zigzagged up to St John the Baptist in Northgate Street. For the three heritage days all the city churches had put on interesting historical displays, with stewards and refreshments, so it really made quite a day out! The Cathedral was buzzing with visitors and the youth choir was rehearsing John Rutter’s arrangement of All things bright and beautiful – lovely to listen to. At St Mary de Lode, built over an earlier Saxon church, I saw the exposed section of Roman pavement, the early Norman arches and the 16th century pulpit. St Nicholas’, Westgate Street, another early medieval parish church, was open especially for the heritage days, visitors being welcomed by a young stewardess in Puritan costume. St Mary de Crypt, Southgate Street, displayed information about the Sunday school founder, Robert Raikes, and other Gloucester notables of the 16th, 17th and 18th centuries, including the founders of the Crypt School. It had a striking, tall east window and wall paintings. Nearby was the Friends Meeting Place in the old Greyfriars hall, and at the end of Brunswick Road, very near to the site of two schools I attended when young, was Christchurch, another Victorian building, with a painted cupola, and, more importantly, a nice welcome from the stewards! Now I had to turn homeward, via St Peter’s Catholic church in London Road, and on towards the other Churchdown parish church of St John, where I was quickly signed out as a wedding was taking place! Back in Cheltenham I called at St Mark’s – again a nice welcome – and St Stephen’s, very busy with a display of church robes and copes and a large amount of information, much of which was about John Middleton, architect and designer of several Victorian churches in Cheltenham. This was a most enjoyable day, and I sincerely thank all of my sponsors for their generosity. I am uncertain about the total raised, but it will amount to more than £250, half of this going to St Mary’s. I ARRIVED in good time at Linda’s house and off we started with son Sam in tow. A brief halt to refit the handlebars on his bike and in no time we were greeting visitors in the porch of St Mary’s. This is what makes our sponsored ride so interesting as one meets up with total strangers who frequently have a good story to recount. A little later we dropped off Sam at Simon’s house and the two of us sallied forth. Later I was able to show Linda a little piece of Cheltenham’s aviation history in that most unlikely of locations, Carlton Street; the clue is ‘Meteor’. We soon found ourselves in the depths of Charlton Kings, mixing with road resurfacing gangs, and a respectable number of churches under our proverbial belt. Linda has a nice new bike with a multitude of gear ratios and we proceeded to gobble up a number of different churches, by which time the sun broke from behind the clouds. Linda has a useful knowledge of the geography of the Naunton Park area and she unearthed a couple of places of worship I didn’t know existed, which was a bonus. We stopped at Cheltenham College hoping we might meet up with our old friend Nicholas Lowton (I love his sermons!!) but no such luck. With St Matthew’s heaving into sight we were pretty much at the conclusion of our target figure. Linda, I am certain, will be coming again next year; after all, her new bike will be nicely run in by then and we can include an extra few churches. We visited 27 churches, met some interesting people, watched a wedding and covered approximately 18 miles. AS AN EXPERIENCED cyclist I thought I should set myself a worthy target and decided to visit all 28 churches in the Northleach Deanery. The closest to home are at Dowdeswell and Whittington, so they would be my first and last, and the furthest are at the Barringtons. The best route worked out to be 70 miles and hilly, in places very hilly, which you must realise has its rewards. I knew I was required to be at the parish fete, the railway station and a wedding in St Mary’s on the Saturday so I decided to ride the day before – a big mistake! All started well and I got up the hill at Dowdeswell and on to Shipton Solers, particularly enjoying riding at Yanworth. As I ate my lunch on a bench at Coln St Dennis the sky turned dark. Sure enough, on the way to Northleach there was rain and as I waited under a tree for it to pass a puddle formed at the side of the road, which quite soon spread to join another from the other side of the road as the rain got heavier and heavier. This was no place for cyclists and I was only a third of the way round my route. After 40 minutes there was a misleading lull and I tried to make it to Northleach. A nice cup of tea and a cake do wonders for morale and when the rain stopped I prepared to set off again. By now I had lost so much time and being wet through I thought it better to head for home with the option of visiting some of the churches on the homeward leg. I hadn’t got to Hampnett before the rain returned. There comes a time when one is so wet there is no point trying to stay dry. Wet glasses are worse than no glasses and trying to read a map in a deluge is impossible. A quiet word with God gave me the strength to meander to some more churches and return home in the dark with the rain just as heavy. Nineteen churches and 50.89 miles. Better luck next time, perhaps! Thank you to all of you who sponsored us on our rides. Half of the sponsorship money is given to the Gloucestershire Historic Churches Trust to help preserve the churches we visited. The other half goes to our own churches in Prestbury. Morning Prayer at St Nicolas’ on Tuesdays is now half an hour earlier, at 9.00am. The Eucharist remains at 10 o’clock, followed by coffee. Do feel free to join us for either or both of these short services whenever you can. This summer’s holiday project focused on the transition to secondary school. It built on work the youth team had done with Year 6 students from local schools in preparation for their move to secondary school. 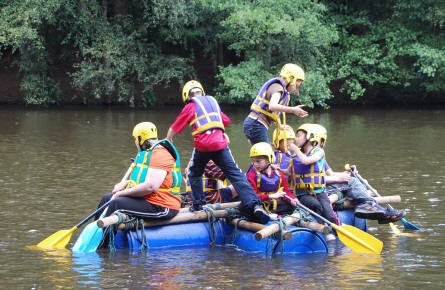 Sixteen young people, four young leaders and four adult leaders got stuck into team activities, cooking, low ropes course, raft building and discussions about the move to secondary school. The other great aspect of the project was the involvement of young leaders – bringing great energy, creativity and their current experience of school life. One young leader reflected: ‘working with younger children made me feel worthwhile, made my summer enjoyable and unwasted’. 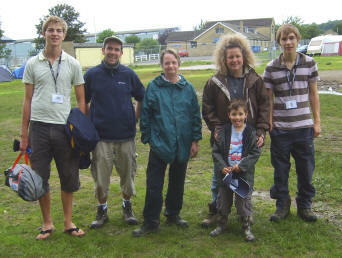 Pittville Youth Action Group has a new Team Worker, Ryan Martin, to work alongside Sharon Macauly on the project. The project works with young people at risk of being excluded or leaving Pittville School with ‘No Employment Education Training’ options. All those who ‘graduated’ last year achieved their bronze and silver ASDAN qualification. Following on from the success of the Alternative Fashion Show last year, PPY will be presenting a creative arts evening on Saturday 15th November, including live youth performances and an exhibition zone. Please do put the date in your diary! I hadn’t camped since I was fifteen years old, so it was with some trepidation that I borrowed equipment from my daughter and set off with a small group from Synergy to Soul Survivor which was being held on the Royal Bath and West Showground. Soul Survivor is a five-day Christian event for young people with the emphasis on worship and teaching. There were two acts of collective worship in each day, held in the big top tent, and various seminars on all aspects of Christian life; all were well attended. There were nine and a half thousand people at Soul Survivor when we were there and eleven thousand were expected for the following week. It was wonderful to experience the enthusiasm of the young people for their faith. It sometimes felt as if the big top would take off with the amount of energy being generated within. But they could be quiet; the teaching element (sermon) during worship often lasted almost an hour and they sat on the floor and listened. Who said young people only have a short attention span? I have been a volunteer with Synergy for about a year. Usually we have about fourteen or fifteen young people at a meeting. Soul Survivor made me realise that there are groups like ours all over the country. Young Christians learning and growing in faith. It also highlighted how important it is for older Christians to support and nurture these young people. They are already part of the church today. They are the church of tomorrow. Our select few turned up at Soul Survivor in great anticipation as it was a venture that had not yet been experienced by Synergy. On the first night we realised the magnitude of the event; the opening meeting was held in a huge tent with several thousand people all joining together in worship. During the day the main focus was on the various seminars and talks going on, which was rather different from what we were used to at Greenbelt where it was the music that seemed to take precedence. Soul Survivor – mud and all! There were two meetings a day in the big tent when everyone would gather, one in the morning and one in the evening, and this was a chance to connect with God and hear from His Word. It was a really powerful experience to see thousands of young people giving everything in worship. I learnt a lot during the week and came away with a renewed faith and awe for the work God is doing. I would highly recommend Soul Survivor to any young people and intend to return next year! On Friday 5th September, I had the thrill of watching the CHADS first performance in the village hall as part of their cheese and wine evening. I was thoroughly entertained by the sketches of comedy, speech, dance, drama and more. The costumes and props were also fantastic. The atmosphere was incredible, knowing that the community had come together to create an event as good as this. As a relative of one of the actors of the evening, I know how much commitment and hard work has been put into the making of this evening and we thank CHADS very much for such a great evening of entertainment. The food was very good at the end of the show as well! As well as this excellent evening’s entertainment £465 was raised, £315 of which will go to ‘Let the Children Live!’ and £150 will go to Prestbury Parish Hall. One could debate whether church buildings should be used for anything other than worshipping God. In Prestbury we do use our churches for all sorts of things, but just occasionally one comes across an incumbent who is not happy with secular concerts taking place in his or her church. Yet the church is often the only building large enough to house an orchestra or choir, and its acoustics seem made for music. For over forty years the Cheltenham Symphony Orchestra, formerly the Sunday Players, has been taking music to places in Gloucestershire and the Cotswolds which would not otherwise have live orchestral recitals, and we usually play in the local church. This summer we went abroad for the first time, and all three concerts were in churches. We spent a week in Cheltenham’s twin town of Annecy in the French Alps. Fifty musicians, with twenty friends/family to boost the audience, took over a couple of hotels in the heart of the old town. Mainly pedestrianised, this part of Annecy feels like a miniature Venice, with the river flowing through from the lake in a series of narrow canals. Our first two concerts were part of a local festival in the Bauges. We played Smetana and Elgar in the modern church of Notre Dame de Plaimpalais in Alby-sur-Chéran, with its lovely large stained glass wall panels. The following evening we played Mozart and Beethoven in the more traditional church of St Pierre in Faverges. Our final concert was in Annecy itself, in a huge edifice called St Maurice, which makes All Saints’ seem small, and which has one of the many river canals flowing directly underneath. Here we made Rossini, Bruch and Rachmaninoff echo around the rafters. It was a most enjoyable week, and I think we played better together as an orchestra because we were also living, eating, swimming, cycling, climbing mountains and sight-seeing together. Nowhere man, can you see me at all? I had probably heard these words hundreds of times before, but all of a sudden they took on a different meaning. It is true: how many of us know where we are going in life, or stand up for what we really believe in strongly? Every day we hear of a new place in God’s world which has been destroyed by greed, man’s inhumanity or simply natural disasters. Peoples who are unbelievably poor in material ways, but who have a richness of faith we find hard to understand. Do they look to God in a different way from the way we do? Is our perspective blinkered by the comfortable lifestyle we take for granted? Like the people of other parts of the world, who are suffering from Aids, famine and persecution and yet can still praise God for the blessings he has given them, and take refuge in the strength that he gives them to carry on each day, how much more thankfulness should we be giving our God for the many blessings he gives us? And more than that, using the gifts that he gives each of us, to try to stretch out a hand of support and love to those who have not heard of our God, or who do not, or feel they cannot, put their trust in him? Our strength comes from community and friendship, from sharing in the gifts of bread and wine in church, from quiet times of prayer, from the support of others; wouldn’t it be great to share this ‘refuge’ with those who need it more and who have lost hope? As we come to the time when ‘Harvest time’ is celebrated, spare a prayer not only for those who have nothing to harvest, but also for the many farmers in this country who have lost so much because of the bad weather. May each one of us trust in God enough that we might be aware of where we are going, and be strong enough to stand up for what we believe is right. And now bless the God of all, who everywhere works great wonders, who fosters our growth from birth, and deals with us according to his mercy. On Wednesday 1st October Father Brian Torode will present Pilgrimage and Medieval Gloucester in All Saint’ Church. The evening will start with a Eucharist at 7.30pm, which will be followed by the presentation, refreshments and an opportunity for questions and discussion. There will not be a Eucharist in St Mary’s on this evening. Harvest celebrations in Prestbury start with the St Nicolas’ Hall 25th Anniversary Tea Party at 4pm on Saturday 4th October (details elsewhere in this magazine). On Sunday 5th October all the morning services in the parish will take place as usual. If you would like to help decorate the churches please bring dry goods (tins and packets) on Saturday or Sunday. These will be given to Cheltenham Open Door. In the evening of Sunday 5th October there will be no services in Prestbury or All Saints’. Instead we are invited to attend the Service of Closure at 6.30pm at St Peter’s church, Tewkesbury Road. If you need transport to St Peter’s please speak to one of the churchwardens. Saturday 11th October is the day to set aside for a good concert in All Saints’ Church at 7.00pm. The now very familiar Welsh Choir will entertain us yet again and, as the costs have been paid for by a generous sponsor, all tickets sold will be profit. They are available at £7.50 each from me and I hope you will support this venture which will be put towards the costs of the Quinquennial repairs at St Mary’s. The new daytime bible study group led by Father David will continue to meet in St Mary’s church on Tuesday mornings at 11 o’clock. The group led by Father Andrew continues to look at the book of Revelation on Tuesday evenings 14th and 28th October in All Saints’ church at 7 o’clock, followed by Compline or Mass at 8pm. All are welcome at either group (or both!) even if you have not been before. There is no commitment to come every week, just turn up. On Sunday 19th October the proceeds from our bakestall will be going to Everychild, a charity which originally supported orphanages in Romania or Bulgaria, but which is now spreading world-wide. We welcome contributions from the A-F team and thank you all for your support, both baking and buying. On Sunday 19th October the Revd Maz Allen from the URC will lead a Taizé-style service in St Mary’s church at 3.30pm. Please do join us for this time of worship and fellowship with our friends from the other churches of Prestbury and North Cheltenham. If you would like to be involved in the music, especially if you are an instrumentalist, please contact either Fr Michael or Maz. Our next meeting will take place on Tuesday 28th October at St Nicolas’ Church at 7.30pm. There is a change to our programme and our speaker will be Mrs Lilian Bill, who will talk about her life as a librarian. Do join us if you can. All are welcome. This year we shall celebrate All Saints’ Day on Sunday 2nd November with a united sung Eucharist at All Saints’ church at 10.30am, followed by refreshments. There will be no service at St Nicolas’ that morning and no 11am at St Mary’s, although Celebrate! and the 8am will take place as usual. If you need transport to All Saints’ please speak to one of the churchwardens. A North Cheltenham Team Pilgrimage to the Shrine of our Lady, Walsingham, is being planned for the May Day Bank Holiday Weekend 2009, i.e. from Friday 1st May until Monday 4th May. If anyone is interested in joining us or would like to know more about Walsingham (the shrine, accommodation, sample programme, transport, cost), please contact me. Booking forms and more details will be available early in the New Year. Rain postponed play as far as ‘Beating the Bounds’ was concerned. Many thanks to all those who put heart and soul into it. The good news is that almost all of the preparatory work is done, which means when we do it – at a time to be decided next year – we will have a really first-class event that everyone can enjoy. Thank you to all who helped, in whatever way, to make the Church Fete such a successful event. Having to change venues because of the persistent wet weather was somewhat unsettling, but on the day we raised £1955 with just a few expenses still outstanding. A really good effort and thank you all. Peter Greaves sends his thanks to the congregation and choir of St Mary’s for the gifts and cards which he received when he left in July.